The Flying Mandolinis all live on Vashon Island, WA. They perform exclusively on various instruments from the mandolin family. Even though each of them also participates in at least 2 other area bands, they have come together for 5 previous Strawberry festivals to find a creative outlet for their acoustic string music – AND to celebrate the joy of playing together, just for the FUN of it. The Flying Mandolinis play a mix of original compositions, American standard covers, and World music. Rumors of their performing hanging upside down by the knees from a high wire stretched between the Hardware Store and the US Bank at a previous Strawberry Festival are highly unreliable, but Chris Anderson swears that their footprints can be seen in a cloggers' cluster on the ceiling of one corner of the Coop. 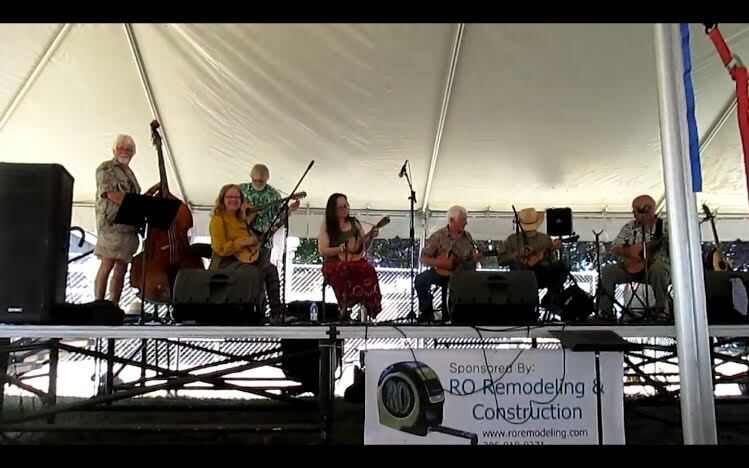 Paul Colwell, Jean Richstad, Jasper Forrester, Cliff Simpson, and Rochelle Munger play concert mandolin. Steve Amsden plays alto mandolin. Lawson Cannon plays octave mandolin. Dan Brown plays upright bass.